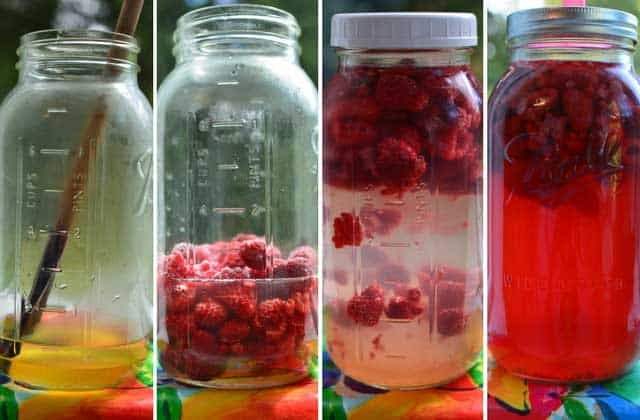 This recipe takes advantages of the yeasts and bacteria naturally present on the raspberries along with the enzymes in the honey to make fermentation happen. No starter required. I like to ferment my sodas in the tall, half-gallon canning jars. They are a convenient size and I find the measurements marked on the jar simplify putting the ingredients together. If you don't have one of these jars, find something similar or adjust amounts to work for the size jar you have. FLAVOR. In the bottom of your jar, dissolve 2/3 cup of unpasteurized honey in a bit of barely warm water. You don't want to kill any enzymes in the honey by using hot water. Add 2-3 cups of fresh or frozen raspberries. Fill the jar with unchlorinated water, leaving 1-2 inches of head space. Gently "shake" to mix: Turn the jar upside down shaking a bit to loosen any honey stuck to the bottom of the jar, then flip back upright. 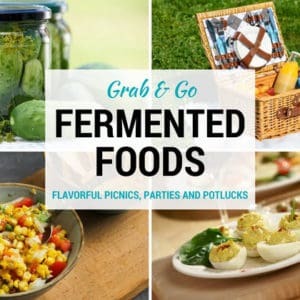 FERMENT for 2-3 days to develop a nice raspberry flavor and give time for the bacteria to eat the sugars in the honey. "Shake" mixture 2-3 times per day. SECONDARY FERMENTATION. To produce natural carbonation, strain into small soda bottles, filling to the top. I reuse my bottles saved from purchased Kombucha drinks. Just be sure to use bottles that have previously held a carbonated beverage. Carbonation Booster? Taste your raspberry soda before starting your secondary fermentation. If there is no sweetness to it, add 1/4 teaspoon of sugar to each bottle. This will give the bacteria something to eat so that they can make CO2 bubbles for you. FERMENT for an ADDITIONAL 2-3 Days. until soda becomes slightly bubbly. REFRIGERATE. Once they are cold, open slowly to release built-up carbonation and enjoy this refreshing drink.